Two important events occurred in recent weeks. There was the great new research on economic mobility that examined different cities and regions across the country (official website here, good NYT summary here) and there was also the Detroit bankruptcy. Given the close proximity in timing of these, a lot of the econ blogosphere discussions tied the two together, at least roughly. See Krugman on Detroit and on economic mobility. See Wonkblog on Detroit here and here. See Yglesias on mobility. To list but a few. Part of the national narrative that everybody knows is that Detroit has been in decline for quite some time. Lost jobs, lost population, automakers struggling in recent decades, etc. What wasn’t as well known was that Detroit proper was in much worse shape than the suburbs (see the Wonkblog links in particular). Even as the auto industry stabilized and rebounded some, these jobs were nearly all in the suburbs and not Detroit itself. So, combining this with the economic mobility and sprawl research, why do we care? A couple of different reasons. First, we know that strong urban cores and the agglomeration effects are great for economic growth (knowledge spillovers, cluster development, etc). However along with the urban benefits come urban problems. You have more density, more congestion, more crime, higher housing costs and the like. Not to mention you also have more usage and stress on the infrastructure, which requires money to maintain and hopefully upgrade. If you have all these things but no tax base, it becomes very difficult to successfully run and fund a city. Or if the demographic and economic trends turn against you, like in Detroit, it creates solvency issues given that today’s population and tax base is smaller than both the built environment was designed for and paying for retirees. Given all of this, I wanted to take look at how urban cores compare with overall MSAs or the suburbs. There are a number of different ways to go about this. For example one can use the Census’ County Business Patterns data to look at job disbursement by zip code, for instance. 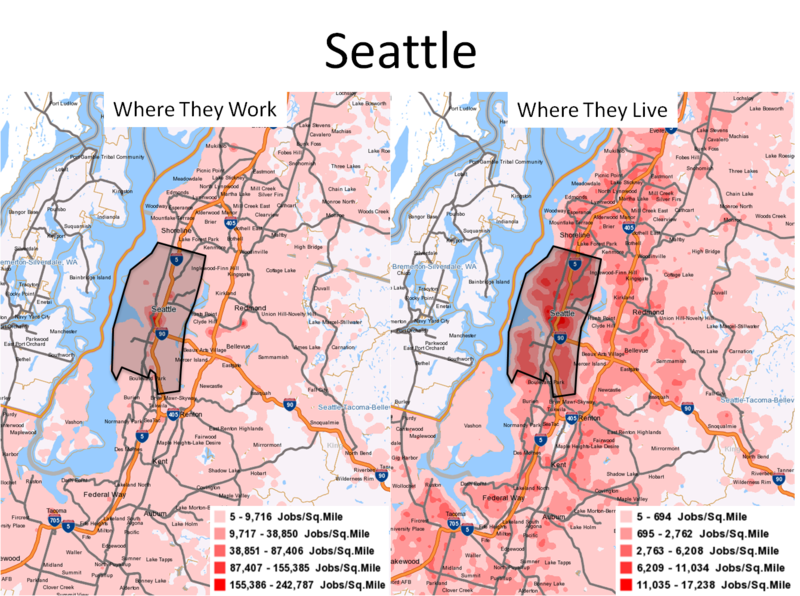 Or use Brookings job sprawl data that looks at the share of jobs within certain radii from the central business district. Both of those are great. However I was trying to get a visualization of jobs across MSAs both based on where people actually work and where they live. I turned to the Census’ On The Map site for just this purpose and have copied some of their maps below. The black outline is my rudimentary estimate of city boundaries. 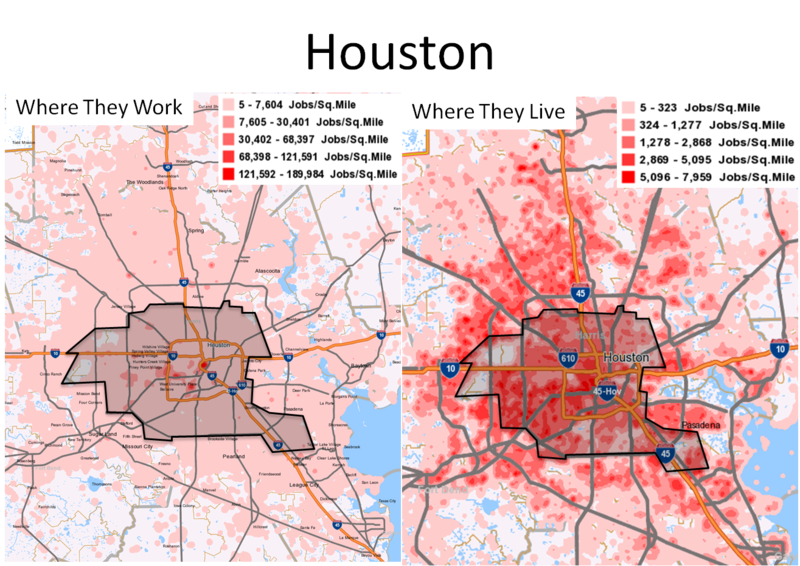 The maps on the left are where people with jobs actually work and the maps on the right are where these same employed persons live (all 2011 data). 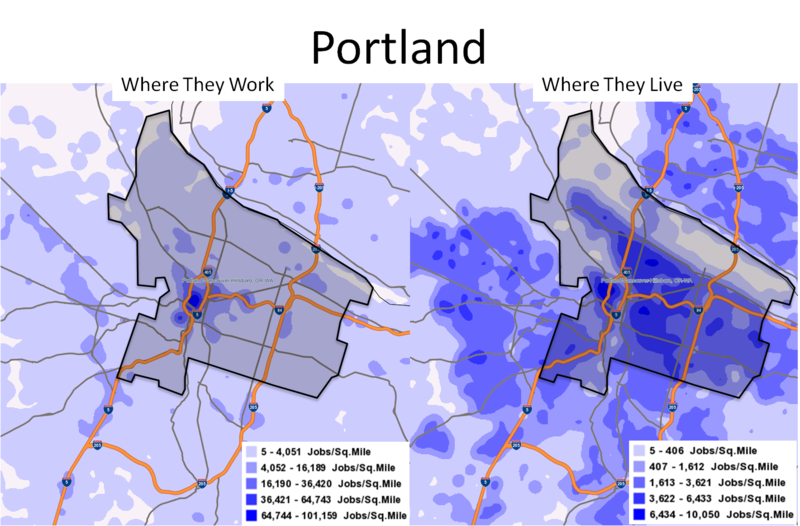 I chose these MSAs to look at either because these cities are famous for sprawl, were heavily discussed in the economic mobility articles and/or are usually used as peer cities for Portland comparisons. Portland: has a strong concentration of jobs in both its urban core plus the string of westside suburbs (the Tigard – Beaverton – Hillsboro corridor along Highways 217 and 26). The location of area jobs closely matches the pattern of where its workers live. This is consistent with the notion that the state and region’s (pick your adjective: good, strong, strict, tight, $*&*#) land use laws have resulted in higher density and a stronger concentration of jobs close to downtown and Washington County. Finally, here is a quick summary table of the Brookings job sprawl data for 2010. The numbers show how close jobs are to the central business district. Based on all of this, Detroit and Portland really are on opposite ends of the spectrum when it comes to economic growth, development and planning. Detroit has a substantially smaller share of jobs in the urban core than even the sprawling cities of Atlanta and Houston (two of the poster children). 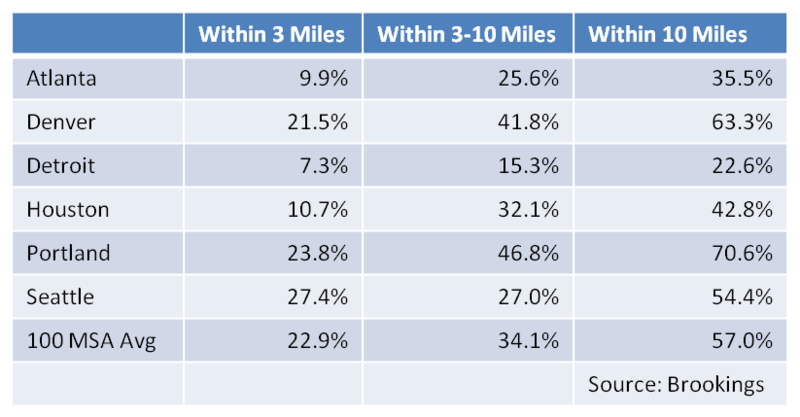 Portland has an average level of employment within 3 miles of downtown, however the job strength in the westside suburbs isn’t that far away geographically and therefore the MSA ranks the highest among this small sample of MSAs (admittedly not a random sample). That’s not to say everything is perfect in Portland, far from it, Portland and Oregon has its own challenges with job and income growth. However, theoretically, growth and development in this general pattern should result in both the urban benefits and the urban problems. Furthermore, by maintaining a strong population base in the city, funding these “problems” and services should also be easier, again theoretically.